FAASST was the best experience and decision I ever made! One day of working with FAASST took 5 seconds off my lap time!!!! I have not only gained more knowledge but way more confidence in my driving. Thank you for giving me the something I can utilize everytime I get on the track! The FAASST program took 10 seconds off my lap times in only a few hours time. It was by far some of the best money I’ve spent in racing. The FAASST program is exactly that - FAST! Thank you, for all your personalized training. The experience was very helpful to my future plans in racing. The knowledge you passed on I will never forget. The car went from average lap times of 1:24 - 1:26 to the fastest lap of the day of 1:19. That is an enormous amount of time to just toss out the window in one day. You taught me so much about my car and increased my driving skills to the next level. I will make sure all my racing friends are aware how important the proper training (Faasst Performance Driving School) is to enhance their ability and fun. In addition to the school at Moroso Motorsports Park, a Faasst instructor acted as my personal driving coach for the race(s) following my school! I finished the enduro 7th in my class (SM) and won my class (SM) in a 5 lap sprint race the same day! Before taking the FAASST school, I wasn’t even middle of the pack, I was back of the pack. I can’t wait to go racing! Thank you for an awesome school. Your ability to analyze a track and even better to teach your students how to do the same was worth the price of admission alone. I got more track time in 1 day than I usually get in 2 days and your feedback on my driving was spot on. I have never improved that much in the afternnoon as I usually peak and then maintain. Dropping 8 sec's from the 1:00 pm run to the 3:00 pm run was unbelievable. Last weekend, I was at Sebring with NASA. I placed 2nd in class on Saturday and 1st in class on Sunday. I ran in the 44 cup series. I hope this can help your marketing efforts. I really enjoyed the class. Small enough to not get lost in the crowd. But big enough that I can learn from other students questions and comments. I like your style of teaching - very relaxed, but direct and to the point. We didn't waste time on trivia. We focused on going faster safer. I also enjoyed your insight on chassis set up. Based on our short discussion, I went home and made some suspension changes. The car instantly handled better and easier. A couple of simple changes - on your recommendation - made a huge improvement. It became a joy to drive, instead of work. Most of the week end I spent practicing what I learned. Everything from hand position to proper apex. Taking it "slow" to really learn those new techniques. Slow is smooth, smooth is fast. Despite moving slowly and deliberately, every lap was well under 2:00. All in all, it was time and money well spent. I think I'll be a much better driver this year. I think next year I'll try for a competition license, and try TT. I am a SRF novice and had the pleasure to work with the FAASST Team at their session this Spring in Houston; and then in July, the owner, Judy Faass, worked with me individually in Pueblo. I had never even seen the Pueblo track, and, building on the basics that I got in Houston, within three hours, Judy had cut my Pueblo lap times by about 20 seconds. FAASST is careful, caring, fun to work with, encouraging, and confidence building. The School has done a world of good for me." I really enjoyed the Faasst driving school. I learned many valuable skills which have helped me perform better on the track. I recommend the course to all racers who want to get an edge on the competition. Before my Faasst school, I really thought I had some decent driving skills. I now realize I had no idea of the potential my car could really do. Every track day now, I’m out there pushing my comfort zone to the limits. I finally feel relaxed and smooth on the race track thanks to Faasst. It’s not about horsepower anymore, it’s about negotiating the turns. Also, now my car is not hurting from hot brakes or bald tires. Even if you have been racing for years or never been on a track, I highly recommend the Faasst school to anyone. I would like to thank FAASST for sharing their knowledge, help and encouragement with me. By combining a scientific approach with practical application on the track, they provided me with a much better understanding of not only the capabilities of the car, but also those of the driver. I was far more confident heading into my first race after all of their valued instruction! We had our first race this weekend and my qualifying time was 0.937 seconds better than my best lap time last year. I started on the pole and just ran away from all of them. I'll keep working on it to go faster yet! My experience with FAASST performance school was the best I have experienced. I learned more in one day than I did attending two other schools. Your background in physics made understanding the concepts of torque and car dynamics a breeze. Thank you for your help. 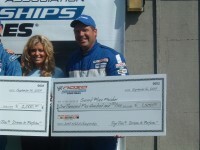 Yesterday I won the main first out of five. There were 2 AI cars and 3 CMC cars. We raced in the rain and I was more than comfortable. I didn't beat myself either, thanks. One of the CMC cars ran out of gas, he was running second behind me, running off line in your class paid off. Today I was running second in class and I didn't give up and it paid off as the first place car ran out of gas today. He finished but didn't have enough to hold me off. "I think you could call this a Banner Weekend"
The FAASST training course provided professional driving tips, in braking, cornering, and sportsmanship. 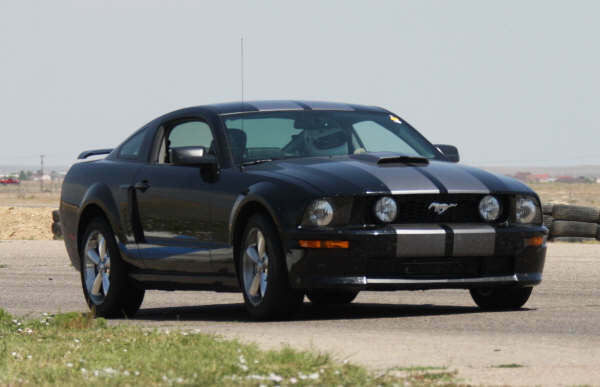 However, what I got out of it the most was a new relationship with my Mustang. We were tight before the class, now I'm able to sense more about my car and its likes and dislikes thanks to the instructions provided by Faasst. The FAASST Performance Driving School is a unique and valuable program which has helped me gain more knowledge and skill. The classroom discussions followed by driving exercises continually lead to faster and faster lap times. The techniques are great! Thank you for the personalized instruction. I really didnt know what to expect, but whatever my expectations, FAASST exceeded them. You gave me a little of something I've been sorely lacking - confidence in my wonderful car and my ability to drive it. It was a gratifying day. 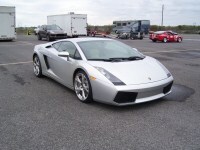 I started going to the track to experience it and have fun. I really wasnt sure I could do this though despite feeling like if theres anything in this world I can do its drive. Now I am sure. And it's only a start. Thanks so much, and keep up the great work! I really want to thank you for the instruction. I felt 9 times more comfortable in the car, and my driving style has been changed for the better. I used all the techniques (including reading corners & tracks) at my autocross and I was flying until my tires gave up the ghost and went away. I feel much more in tune with my car now and even drive in the new driving position. It makes a world of difference. I am actively telling anyone and everyone they should take your class! For five years I have been racing circle dirt in IMCA. My goal in taking the FAASST Performance school was to learn how to race on a road course. This was important because I had signed up with Sugar Grove Custom Cars to drive for them on a National level. I found the intense and complete instruction provided by the FAASST Performance School to be exactly what I needed for me to be successful. At the National Run and Gun Event at Gateway I won my class. And I am confident that additional exposure to FAASST Performance through lapping sessions with more instruction will help me be successful as I compete for SGCC in 2009. The FAASST driving school is unique and well planned. The balance of classroom and seat time help you drop lap times quickly. The instructors are knowledgeable and bring you from looking at the basics to busting it down the track in a short time frame. I thought enough of the course to repeat at another track and felt I learned as much the second trip as the first. I would like to take the time to thank the FAASST Driving School for helping me. 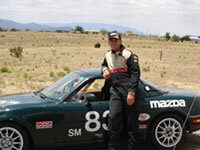 I came to the class with only oval asphalt racing experience and had never turned a lap on a road course. I decided to try my hand with the SM class and thought a driving school would be the best place to start. I am very pleased with my choice in the FAASST Driving School, and with your teaching. I started the day with lap times around 1:08, and by the end of the day I had shaved five seconds off my starting time. I raced in my first two regional events the next two days and with your continued tutoring I was able to start the Sunday event in the number three qualifying position and I had the second fastest lap time of the race (1:01.71)! Please feel free to tell anyone thinking of using the FAASST Driving School for their road racing skills that I will gladly let them know that their money will be well spent. As for me, I am now with your help Driving FAASST! FAASST was a huge part of my racing program this year. I was a complete auto racing rookie, but FAASST brought me up to speed almost immediately as I finished second in my first race and won my second. I believe FAASST was the single most important component of my winning season. I attended an SCCA Driver School at Homestead after the Faasst school at Moroso, and this past weekend, I attended our first Regional race. Out of 22 cars, we finished 7th, and 3rd in our class (with the wrong gear, springs and sway bar). I find myself remembering all of what the class taught us while out on the track!! I believe that the measure of instruction is how well it was remembered. Thanks again!! 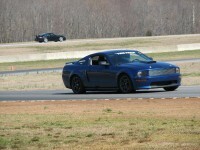 I attended the FAASST driving school at Virginia International Raceway (VIR). Great school, it was a pleasure to attend. I got about 3 hours of track time on Thursday. The instructors were very good, knowledgeable, thorough and supportive. The FAASST school was by far the best of the driving school I have attended. Thank you for the driving experience. I thoroughly enjoyed the entire experience. I just want to let you know that we took home a trophy from the car show we entered the day following my driving course with you. Driving a race car has been a lifelong dream of mine. Judy has taken me from watching racing on TV, to owning and driving a championship winning race car. She has the skills and the knowledge to take you wherever you want your driving to go – from a fun afternoon of driving hard in your own car – all the way to winning races. It all started with my phone call to FAASST, and that first track day in my daily driver. If you have the urge, see what you can do… It might be the best call you ever made. I came to Faasst Driving School as a total beginner. I received a full day of classroom instruction and lots of track time. Basic rules and techniques were taught as well as driving exercises were individually critiqued. 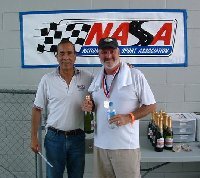 At the end of my first year of SCCA racing I truly felt Faasst Driving School had really helped me in making it onto the podium several times in the sealed spec miata class(SSM). I just wanted to say thanks again for all your help at Mid-America. I started the day not realizing how unprepared I really was to drive the race car and walked away at the end of the day not only feeling totally prepared but feeling like I could go out and be competitive at any track. Your passion for racing is inspiring and your commitment to building champions makes me very proud to add being a graduate of your school to my resume. With the tools you provided me I know I can continue to improve and really feel like I can be competitive on a National level someday. I still call her and ask for tips on new tracks, questions about technique or just to BS. I made a good friend and a fantastic Maestro. Thank you FAASST Performance Driving School. 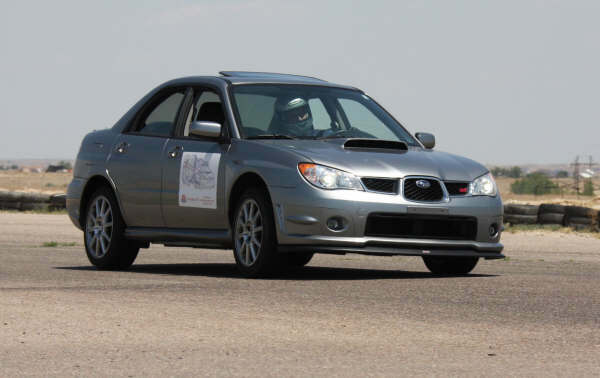 The FAASST Silver Package High Performance Driving School was the greatest way to start a racing hobby. 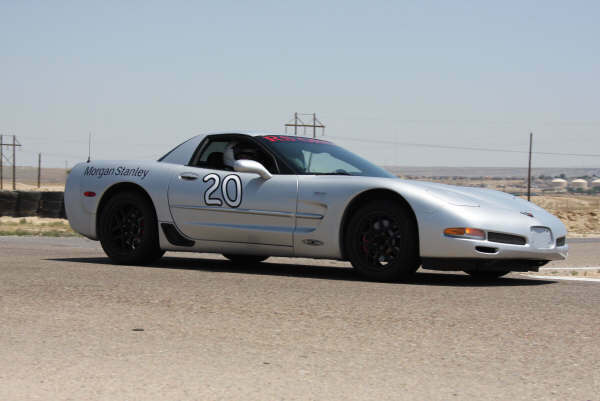 I showed up at the track not knowing what to expect and found myself with a thorough understanding of high performance driving, from the technical aspects of vehicle dynamics to applications of techniques on the track itself. FAASST left me with enough knowledge and techniques to fill many lap days with practice, and I couldn't have started my racing hobby at a better place. An update on a my racing status after the FAASST School. Completed SCCA driving school. Won 1st in the DS race against some young talent. Came in third out of six Miatas in today's regional race. Just want to say thanks for your support. I came to the FAASST performance driving school expecting to learn new driving skills, what I left with was something much more valuable; a new perspective and a fresh attitude. Its difficult to describe - I look at a race car differently, I feel different inside one, and I execute with a confidence that I never thought I'd have. The FAASST curriculum provided me the knowledge and resources needed to succeed in racing: from mental to physical, pre-race to post-race, practice to podium. 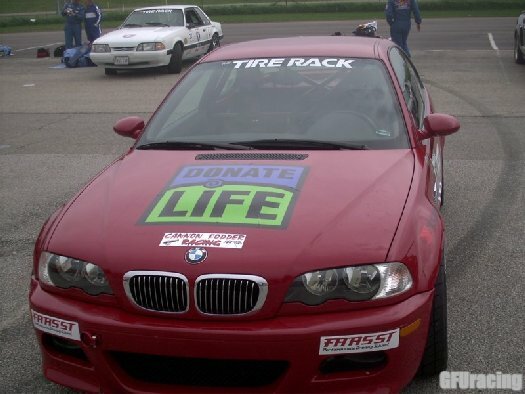 I would highly recommend the FAASST performance driving school to anyone serious about racing. I highly recommend the Faasst Performance Driving School. By using the techniques learned in this program, I have gone from running in the middle of the pack to running up front. Faasst definitely knows how to get the most out of you and your car. After already garnering 5 national titles in 3 different disciplines over the years, I believed I could quickly take that experience into a big formula open wheeled car series and do pretty well. That was my first mistake, assuming that some talent in other race disciplines was enough. The tiniest lessons made the biggest differences, and I for one, appreciated the no nonsense, to the point tuition, that I was given at the Faasst Race School. The Faasst instructors understood each student as the individuals they were, with the different needs they demanded. Faasst made it easy and comfortable , when I left, my ego was still in place, I was faster, smoother, more confident, and more importantly, a safer driver. Thanks so much again for everything. The class was worth every penny. I feel like I learned about 5 years worth of track experience, in 1 day, amazing! 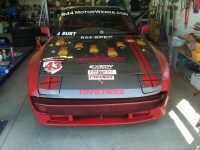 I hope to either get into One Lap of America in the next couple of years, or start competing in some SCCA class. And when I do, I guarantee you I will be hitting the podium regularly, all thanks to you. Faasst is the real thing when it comes to racing! They have the knowledge and the ability to impart racing facts that will make you a better driver. I would highly recommend the Faasst Driving School. About a year and a half ago I had the pleasure of going to a very reputable high performance driving school for two and a half days. I had a great time but I was frustrated because very little of the experience I gained could be practiced or applied. After only one day at your school I learned more useful information and gained an understanding of race car dynamics than I learned in two and one half days at the other school. Your method teaches the important fundamentals in a way that will stay with me and I'll be able to practice and improve on for the rest of my life . My son and I (64 and 40 respectively) recently attended the Faasst Performance Driving School safety course and track day at PMP, and were really pleased with the experience. The safety class, the inspection process (which is mostly educational), and the opportunity to have unrestricted track laps at the conclusion of the 3 hour safety course were a fantastic bargain. The Faasst School also provides performance driving classes for those that might be interested. And for the record, the instructors are excellent with racing backgrounds and fantastic insights into providing individually tailored training for students based on their own experience level, car interest, and learning situation. I learned a lot about myself and my car after a full-day at Faasst. My lap times came down, my effort went down and my fun level went up. I’d never hesitate to recommend Faasst to anyone. FAASST Performance Driving School opened my eyes (and my throttle) to the terrific experience of driving fast with control and confidence. First I found that the performance limits of my car are way, way further out than I thought. Then the Faasst instructors helped me discover that my limits are way further out than I thought. I’m going back for more. I think this is the beginning of a magnificent addiction! The FAASST School is absolutely phenomenal! The curriculum is right on target giving the driver the tools needed to be competitive and fast from the beginning. I continue to see Judy and her staff at events and they provide advice on how to further my progress. I am confident that without the FAASST School it would have taken years to figure it out on my own. So for those of you who are serious about getting the most out of your car, the FAASST School is the way to go! For those of you who are not, get out of my way!